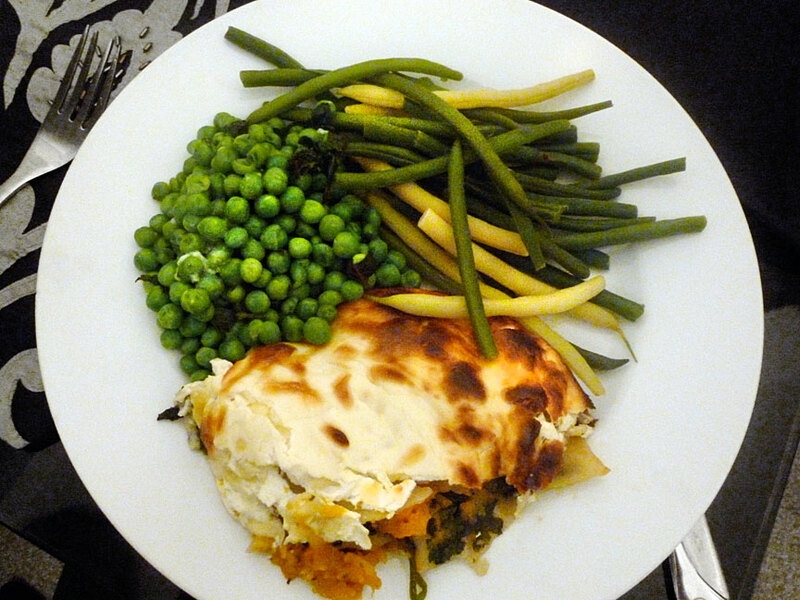 The orange filling looks like sunshine, but the cosy lasagne is autumn all over. I guess this is the culinary equivalent of these sunny, freezing days we’ve been having. This is an easy dinner party dish, as it takes care of itself while you’re greeting people and eating nibbles. If people are a bit late, you can just turn the oven down for a bit, then turn it back up at the end. Are there any uses for the squeezed out water from cooked spinach? It looks so full of healthy potential and it breaks my heart seeing it head down the plughole. I made this for my birthday dinner, which saw six of us eating around a table designed for four. Do you have a favourite fool-proof entertaining recipe? 2-3 tablespoons sage, if fresh, 2 teaspoons if dried. 150g grated cheese. I used cooking mozzarella, but cheddar would do. Heat oven to 160 degrees. Chop your butternut and potatoes in to quite small dice – about 1.5cm. Oil and season with salt, pepper and your sage. Put in the oven once heated. After 12 minutes, add your onion and give a stir to cover in the seasoned oil. The squash will be ready after 20-25 minutes, when it yields to a knifepoint. Meanwhile, mix the ingredients for your topping in one bowl for later. Cook the spinach (steam, boil or microwave) and when it is a bit cooler, squeeze out most of the moisture into the sink. Mash the veg roughly with a potato masher, still on the roasting tray. You want some smooth and some lumpy for texture. Make stock with 150ml water and mash it into the veg to give a more spreadable consistency. In a lasagne dish, spread one thin layer of the squash and sweet potato. Cover with one layer of lasagne sheets. Layer on all of your cooked spinach, then another layer of squash, and another of lasagne. This is where my mixture ran out, but if you’ve got more, do another layer. Top with the creamy topping and bake in the oven for 30-40 minutes. You want some nice brown bits on the top, but if it’s catching too much, pop a piece of foil over the top to protect it. That was equally exciting also as insightful! Thank you for sharing your ideas with us. why not use the spinach water as stock in this recipe or to mix with a veg stock cube to add flavour and goodness to your stock?